Our Tiny Tigers program is designed to introduce basic martial arts concepts and values to younger children so that they are better prepared to join the traditional Tang Soo Do curriculum when they "graduate". - Classes are for kids 4-6 yrs old. 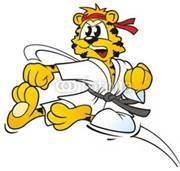 - Kids will be required to wear a karate uniform. Uniforms are $25. First time sign-up’s for the 3 month option get a FREE uniform!